“Environmental justice is the fair treatment and meaningful involvement of all people regardless of race, color, national origin, or income, with respect to the development, implementation, and enforcement of environmental laws, regulations, and policies.” U.S. Environmental Protection Agency. 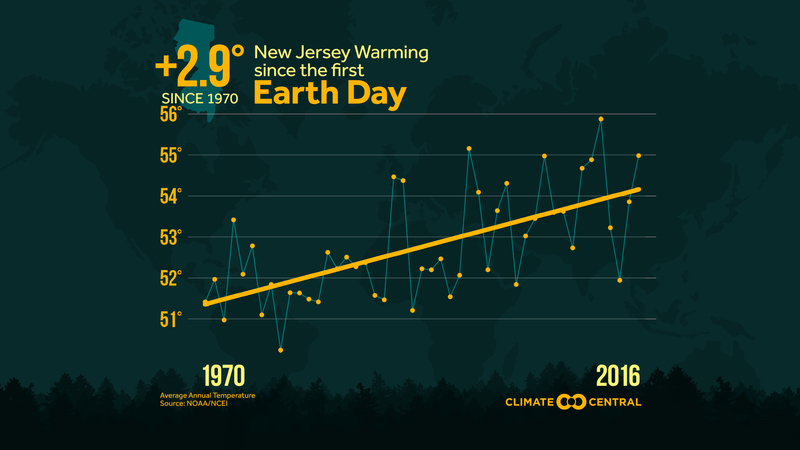 “New Jersey Warming since the first Earth Day,” Climate Central. Union of Concerned Scientists, Northeast Climate Impacts Assessment Synthesis Team, “Confronting Climate Change in the U.S. Northeast: Science, Impacts, and Solutions,” July 2007. Sustainable Jersey Climate Change Adaptation Task Force, “New Jersey Climate Change Trends and Projections Summary,” September 26, 2011. National Aeronautics and Space Administration, “2016 Climate Trends Continue to Break Records,” July 19, 2016. National Conference of State Legislatures, “Climate Change and the Economy/New Jersey: Assessing the Costs of Climate Change,” 2008. “Extreme Precipitation Events are on the Rise,” Climate Central, May 6, 2014. NJ Climate Adaptation Alliance, “Assessing New Jersey’s Exposure to Sea-Level Rise and Coastal Storms: Report of the New Jersey Climate Adaptation Alliance Science and Technical Advisory Panel,” October 2016. US Energy Information Administration, “State Carbon Dioxide Emissions,” November 3, 2016. U.S. Environmental Protection Agency, “2015 Greenhouse Gas Emissions from Large Facilities,” reported to EPA by facilities as of August 13, 2016. The California Car program is based upon the 1970 Clean Air Act provisions that permit California to adopt more stringent auto-emissions standards than the federal government sets. Other states also may adopt the California emissions standards. New Jersey is considered a California Clean Cars state, and specifically one of 10 Section 177 states that are part of the Zero Emission Vehicle (ZEV) program. Based on the travel provision, auto manufacturers have been able to bank credits in Section 177 states for ZEVs based on ZEV sales in California. This credit program will expire in 2018, which makes it even more critical for New Jersey to ramp up its electric vehicle program. “U.S. : Section 177 States,” TransportPolicy.net, September 6, 2013. New Jersey Department of Transportation, “New Jersey Annual Certified Public Road Mileage and VMT Estimates,” 2015. The U.S. Department of Transportation’s National Highway Traffic Safety Administration is responsible for establishing Corporate Average Fuel Economy (CAFE) standards under the Energy Policy and Conservation Act, as amended by the Energy Independence and Security Act (EISA). Its first National Program addressed 2012-2016 vehicles and the second phase of the national program covers 2017-2025 light duty vehicles. U.S. Environmental Protection Agency: Regulations form Emissions from Vehicles and Engines. Environment New Jersey Research and Policy Center, “Turning to the Wind: American Wind Power is Cutting Carbon Pollution Today and Paving the Way for a Clean Energy Future,” Winter 2015. John Hasse, “Final Harvest in the Garden State: New Jersey’s Struggle with Suburban Sprawl,” in Earthcare: An Anthology in Environmental Ethics, eds. David Clowney and Patricia Mosto (Lanham: Rowman & Littlefield Publishers, 2009). Richard G. Lathrop and John A. Bognar, Center for Remote Sensing and Spatial Analysis, Rutgers University, John E. Hasse, Geospatial Research Lab, Rowan University, “Changing Landscapes in the Garden State,” December 2016. State Planning Act, N.J.S.A. 52:18A-196 (2006). New Jersey Pinelands Commission, “New Jersey Pinelands Long-Term Economic Monitoring Program: 2015 Annual Report,” June 2016. Kirk Moore, “Money and Sand: Will There Be Enough for New Jersey’s Beaches?” NJ Spotlight, September 29, 2016. “Dirty Little Secrets: New Jersey’s Poorest Live Surrounded by Contamination,” WNYC, December 9, 2015. Ben Horowitz, “Why 11 N.J. cities have more lead-affected kids than Flint, Michigan,” nj.com, February 3, 2016. City of Newark, Environmental Justice and Cumulative Impact Ordinance, July 7, 2016.